Terrifier is a video nasty throwback: a lurid, squalid, and brutal affair. It’s even gorier than the last uber-violent killer clown movie we’ve seen, the wonderful Irish horror, Stitches (a movie with an unfurled ocular assault that made its way into our book, Death by Umbrella, though it was actually the killer umbrella in Silent Night, Deadly Night Part 2 that inspired the title). Terrifier’s clown is a leaner, meaner, emaciated, commedia del’arte Captain Spaulding. And man is he terrific. David Howard Thornton thoroughly and completely embodies Art the Clown, easily one of the most uniquely, and yes, “terrifying” horror antagonists to come down the pike in a long, long time. His birdlike fidgeting and prominent gums make for a revolting and memorable spectacle. A lone survivor is recounting Art’s exploits on some sleazy investigative journalism show. Then we’re on on the streets and back alleys of Anytown, USA on Halloween. It’s dark, largely abandoned, and its mise en scène recalls the desolate Brooklyn boulevards of Bill Lustig’s Maniac. Two young women are being accosted by a clown, who follows them into a pizza parlor after slashing the tires on their car. Since they’re both inebriated, one of the girls calls their sister to come pick them up. Then, their hell night ends up in a creepy warehouse that’s being fumigated by pest contractors who for reasons unexplained, don’t bother to wear protective masks (but that’s another story entirely). The rest is dour nighttime stalk-and-slash, and there are some terrific and truly surprising set pieces, including a truly vicious kill can only be described as “too brutal by half” (no spoilers here). Some sinister stuff indeed. 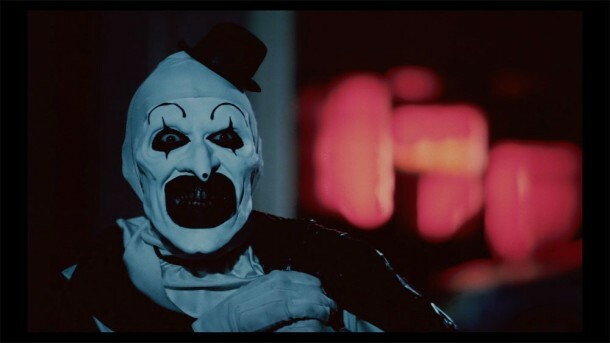 However, Terrifier somewhat unravels by failing to follow the “less is more” ethos when it comes to showcasing the killer. When there’s an antagonist this fearsome and foreboding, his impact is diminished by keeping the camera on him for so long. It’s something John Carpenter understood in the first Halloween, but what David Gordon Green fails to grasp in the new one. Here, there is just too much Art, almost Art for Art’s sake. While the rest of the film doesn’t entirely coalesce around him, there’s enough marrow on this bone to more than satisfy gorehounds. This entry was posted in Exploitation films and tagged 2010s movies, slasher films by Really Awful Movies. Bookmark the permalink.